Ever wanted to get up close and personal with me? 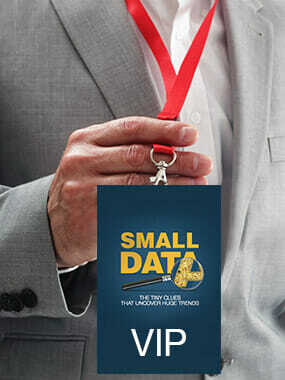 As a special thank you to my fans, I’m excited to offer a very special Small Data VIP Experience. This exclusive and intimate package gives you access to see my brand new Small Data presentation ahead of the worldwide tour and the chance to enjoy cocktails and conversation with me – all at a private function in New York City, along with Paco Underhill, author of Why We Buy, and other luminaries. It happens Friday, February 26. I would be honored to spend some time with you and get to know you better. Here’s the only way to get access. Invitation to the party is only available to people who order 100 copies of my latest book, Small Data. It’s a very special way to thank you for supporting my mission to change how businesses value the consumer. All you need to do is click here and let us know you want to purchase 100 copies. One of my team members will be in touch with how to get your copies and full details on the event. Now, bear in mind, there’s only 10 tickets available. If you want to take advantage of this once in a lifetime offer, you need to act now. Click here and my team will take care of you. Head over to martinlindstrom.com/smalldata and learn more about the stories that inspired me to write, what I believe, is my most personal book ever.